It was a cold and gray early winter afternoon outside the Hunt Yachts factory in Portsmouth, Rhode Island, so Peter Van Lancker, Hunt president, and I put on extra fleece and heavy coats before we headed for the docks to test the new Hunt 32cc. Minutes later, however, as we cruised down Narragansett Bay, our weather concerns were long gone. For one thing, we were protected on three sides by the large helm console in this prize-winning boat. For another, as I nudged the throttles forward to a top speed of just over 48 knots, the adrenaline rush made up for all the heat we needed. Despite the cold, the water was relatively flat this afternoon, so we weren’t able to give Hunt’s iconic deep-V hull a rough-weather test. But I’ve cruised on a lot of Hunts over the years, from Florida to Maine in all kinds of conditions, and I know that Hunt hulls, originally designed by C. Raymond Hunt (think Bertram 31), deserve their outstanding reputation for speed, seakindliness and safety. I have no reason to believe that this 32-foot center console, with a 23-degree deadrise at the transom, would behave any differently. Indeed, as I steered the wheel over into a sharp turn at 40 knots, this classic beauty simply dug in and carved an arc in the water without missing a beat. 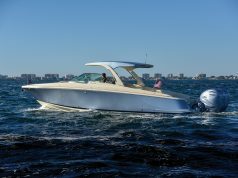 Named “Best Overall Powerboat” at the 2015 Newport boat show, the Hunt 32cc is more than just one more entry in a crowded market. 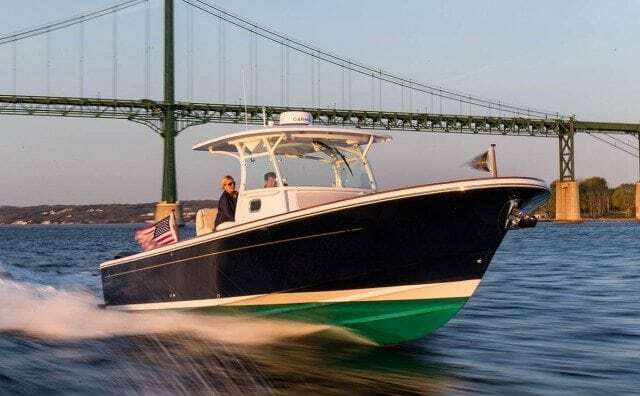 A center console with a touch of class, the boat boasts Hunt’s elegant downeast lines, gold cove stripe, just enough teak, and a dark blue hull. 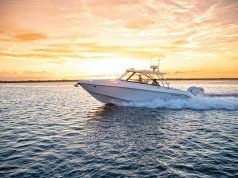 The result is an easy-to-use, easy-to-put away boat that’s just as much at home heading for a day of offshore fishing as it is lining up for the yacht club cruise. You can also use it for diving, a picnic, a day cruise, or even as a tender to a megayacht (the Hunt 32 would fit in perfectly in the harbor at Monaco, delivering guests to an evening of gambling at the Monte-Carlo Casino). 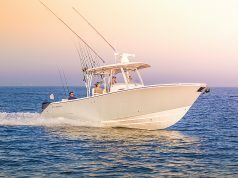 In designing the 32cc, Hunt has tapped into the growing center console market, as many buyers are opting for hassle-free boats they actually use and enjoy, as well as into the expanding outboard-powered market, as outboards have become more powerful, more fuel-efficient and easier to use, maintain, and (when necessary) replace. Standard power on the Hunt 32 is twin 250-hp Yamahas, but our boat this afternoon had twin 300-hp Yamahas. Other center consoles, of course, also have outboard power, and some also have built-in heads or small sleeping areas below. But the Hunt 32cc is exceptional in packing a true cabin below with standing headroom including an enclosed head, a single berth and what the company calls “a galleyette” to prepare quick meals on board. To make room for this, the large helm console is offset slightly to port while the center console’s traditional walkaround area is on the starboard side. The easiest access to the boat is to climb on the teak-covered swim platform. A sturdy transom door opens on the starboard side to the cockpit, where a bench seat is centered against the transom. It folds away if you want a larger cockpit area for fishing. A door in the port side is an option for diving or water sports. Walking forward, the bow area has a big fairly plush upholstered wraparound settee that could hold eight people; an optional varnished teak table is available for drinks or lunch. The wraparound handrail around the seating area is recessed for safety. 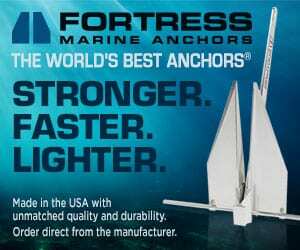 For fishing, an insulated fish box is under the port lounge; you can slide a fully rigged rod into a compartment in the starboard side. The large helm station protected by a standard T-top and surrounding acrylic non-scratch windows, is comfortable, ergonomic and user-friendly. Two people fit with room to spare at the helm in oversized seats with adjustable bolsters and armrests. The seat base flips up for a leaning post with side bolsters. The helm pod is varnished teak and there’s also a teak footrest. Two Garmin 15-inch MFD screens provide all the usual plotter and nav data. Buyers have two choices for the large console section aft of the seats. 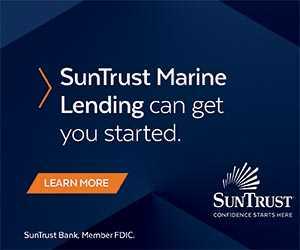 The entertaining version offers an electric grill, drawers and stowage cabinets, while the fishing version includes a 30-gallon livewell, sink, bait stations, and tackle and knife stowage. Access below deck is via a large, lockable sliding door on the port side and down one teak step. The aft-facing door means that the helmsman can keep track of anyone going below—children for example. “It’s family friendly,” said Van Lancker. “That’s what this boat is all about.” The head, which can be enclosed with a bi-fold door for privacy, is to starboard. The head has a molded sink with pull-out shower (there’s another shower in the transom), Corian countertop, a fresh-water toilet feeding into a 15-gallon holding tank, a mirror and a towel rack. It’s a real head, in other words, in a 32-foot center console. The “galleyette” to port includes an icebox and optional microwave. (If you want the microwave you have to order the optional inverter to power it.) The full-length berth is forward and extends under the foredeck. It’s a great place for an adult or a couple of kids to take a nap and is covered with Sunbrella fabric. Surprisingly, the cabin is filled with light due to a flush, fixed window across the front of the console and an opening port above the galleyette. The hull lives up to Hunt’s legacy. It’s built with solid E-glass bottom laminate with Vinylester osmosis barrier and foam-cored topsides. Like other Hunts, the 32 is a dry boat, with lots of flare in the bow. The sharp entry, strakes and chine flats also direct water aft. Under way, the acceleration is fantastic. Nail the throttles and the G-force will push you back in the bolster. Carving high-speed turns is simply fun. Hunt’s adrenaline-pumping performance is one thing; the 32’s outstanding fit and finish are another. If anything, this area has even improved since Hinckley bought the company.